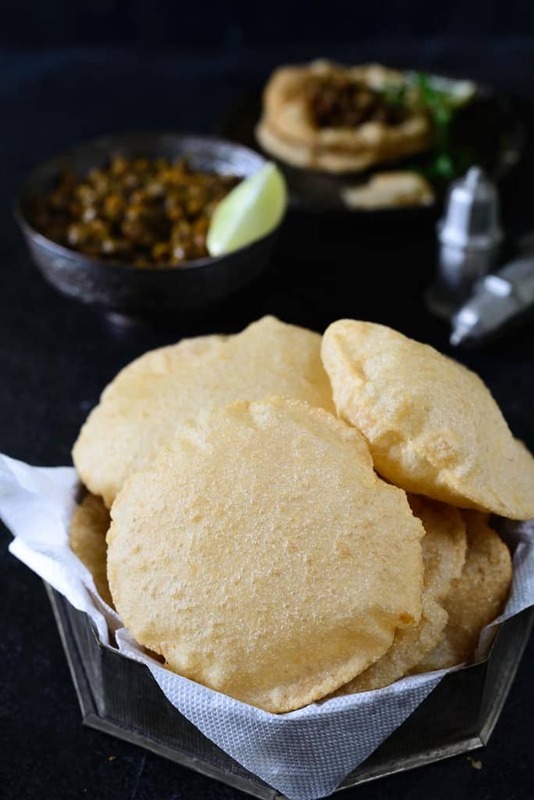 Poori / Puri… A quintessential deep-fried Indian bread, it is a food staple that is enjoyed across the length and breadth of India. Although originally from North India, it is now a food accompaniment that can be eaten at any time of the day, whether breakfast, lunch or dinner. Although it is a staple in most Indian houses, not many can make perfectly puffed up poories. 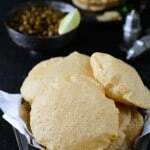 There are a few tips and tricks on how to make perfect Poori which fluff up every single time and you will find these in the poori recipe below. Making of poories requires very basic ingredients like Whole Wheat Flour, fine sooji or semolina and oil for frying. I mostly use rice bran oil or vegetable oil to fry poories. The trick to make fluffy poori likes in rolling the dough softly and then frying it in piping hot oil. Knead the dough a few times before starting to roll the poories to make it perfectly smooth. I add a little sooji to the dough as I like my poories crispy. If you want to omit it, you can always do that. Start to roll the dough gently and apply gentle pressure on the sides while rolling. The centre of the poories should be a little thicker than the edges. The oil should be piping hot before you put your rolled poori into the oil. Once the oil reaches the piping hot temperature, simmer the heat to medium and then fry the poories. Keep increasing the heat after frying 5-6 poories and bring back the temperature of the oil to piping hot. Prepared with wheat flour, this 2 ingredient bread does not take much effort, but can elevate even a simple meal to a gourmet’s delight. Relish it with dry sabzi such as Achari Aloo or a gravy based Restaurant Style Dum Aloo, or even a chatpata Masala Channa Dal and you will be asking for more. 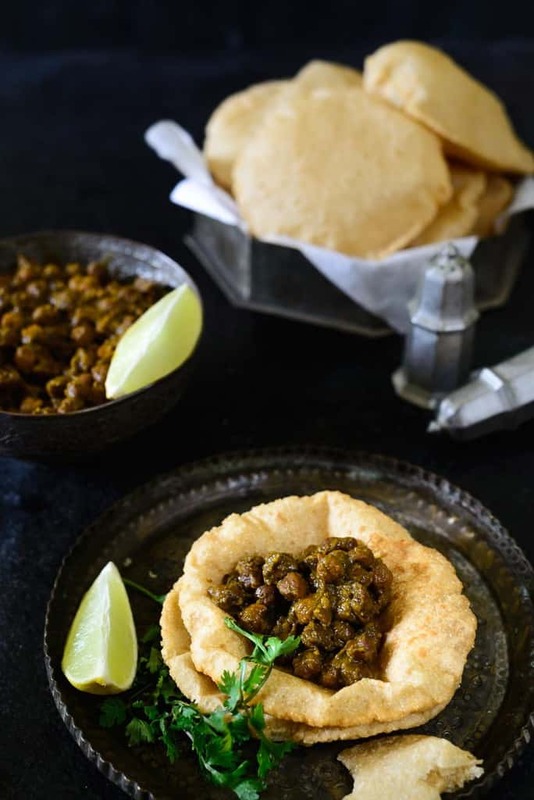 Here is How to make Perfect Poori . Mix whole wheat flour, salt and sooji in a bowl. Add little water and knead to make a tight dough. The consistency of the dough is very important in making good puffed up poories. It should be tighter than the regular roti dough. Cover the dough with a moist cloth and keep aside for 15 minutes. Knead again for a minute and then divide the dough into small lemon sized balls. Roll each ball into a 4 inch disc. Do not roll the poori too thin. To check if the oil is hot enough, drop a small ball of dough in the oil. If it rises immediately, it means the oil is hot enough. Slip a poori in the hot oil. Press gently and fry till poori puffs up. Turn and fry from another side till golden brown. Drain the poori on a plate lined with kitchen towel. Make all the poories in the same manner. Serve hot with Dahi wale Aloo, Sookhe Kale Chane or any other curry. Yes Daniela. It is Semolina. You must use the fine variety for making Poori. I believe Sooji is one of the secret ingredients for those perfect yummy puri’s and dahi wale aloo sounds great. look forward to finding the recipe here, and great pic I must say. The Whole wheat flour is that the atta used for making chapattis?